I read every moment I possibly can and still the odd one manages to sneak past me – had Paul Morgan of Coch-y-bonddu Books not put this one in my hand at Lowther last year, my life would definitely be a little poorer. 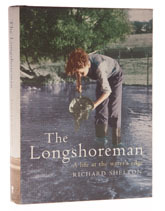 The Longshoreman is a kind of rag-bag of bits and pieces, stuff and musings by Richard Shelton, who ran the Freshwater Fisheries Laboratory at Pitlochry for nearly twenty years and is presently research director of the Atlantic Salmon trust, so the chap knows his fish. You only have to read a little way to discover how to avoid losing lampreys in long grass, by way of steam trains and whelk boats. This is a collection of tales of fish and fisheries, of wildfowl and weather, bound together by a greater understanding of nature than most authors will ever know. The chapter on drift netting is not only well written, but carries an uncomfortable message for the politicians who so conspicuously failed to act on the Northumbrian fishery, hiding behind claims of ‘tradition’ when the methods in use were anything but. A good read and an informative one to boot. The hardback is now out of print, but at the time of posting in 2011, The Longshoreman was still available as a paperback. Needless to say, it is worth checking with Coch-y-bonddu if you want the hardback.